Following the Great Recession, the American dream of homeownership was progressively sliding downward. Now, the dream is back and continues on an upward climb. Figures show that from 2015 to 2016, the number of non-homeowners (mostly renters) looking to purchase mortgages increased by over 11%. From 2016 to 2017, there was a 10% increase in renters pursuing the American dream of homeownership. Even more striking than the overall figures is millennials’ increased interest in homeownership. According to a TransUnion analysis, in the first quarter of 2017, 29% of all non-homeowners looking to purchase mortgages were millennials. This was up from 28% in 2016 and 27% in 2015. Studies show that interest in homebuying is high, but is it the best deal for everyone? This thriving interest in homeownership is great news for Guardian — our investment fund that helps qualified families achieve the dream of homeownership — yet we find that many of them are not aware of Guardian’s existence. In fact, they don’t even bother to look for such a program, because they mistakenly believe that there is nothing like it available to them. Why do many people in this situation feel it is hopeless to achieve the longstanding American dream of homeownership? The reason is twofold. First, it is hard to find a lender who will underwrite a mortgage in the $50,000 range — not an unusual price point for the kind of “starter homes” we sell through Guardian. A few credit unions will consider loans in this range, but most mortgage brokers won’t go below $75,000, preferring to do even larger deals. No matter how good the home buyer’s credit is, if the mortgage isn’t above the broker’s minimum, the deal is simply not going to happen. Second, many potential homeowners have some type of blemish on their credit, preventing them from qualifying for a mortgage with a traditional lender. What is important to us and to our underwriters is the reason for the blemish. We look at whether there is a pattern or whether the blemish is more of a one-time event. If the credit issue is a pattern, the applicant is probably not going to be approved. (People who have a string of credit problems are most likely not going to change their ways in the future.) However, if the issue was a one-off and there was a reasonable explanation for it, the applicant is probably financially responsible, making them a plausible candidate for a Guardian home. Nevertheless, despite the renewed interest in homeownership, along with the generally-accepted belief that owning a home is the quintessential American dream, homeownership isn’t always the smartest move. When (and where) should you buy versus rent a home? GOBankingRates has performed a survey to determine just that. Below is an article with their findings, including a link to the results by state. 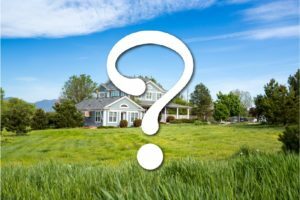 Real estate prices are extremely localized, so I wouldn’t suggest you take the survey at face value and base all your investing or buying decisions on it. However, it is interesting to get a flavor for how the figures break out across the country. Can’t decide if you should rent vs. buy? 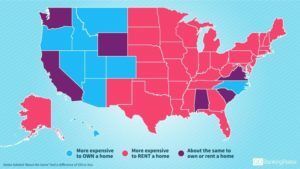 See the most affordable option in your state. Click on the map to find out which option is better for you. For this year’s study, we looked at the estimated rent price for all homes listed on Zillow. (However, it’s worth noting that in last year’s study, we examined the cost to rent only single-family homes). We also calculated the estimated monthly mortgage to own a home in each state, based on the median list price of homes listed on Zillow, a 20 percent down payment and a 30-year fixed-rate loan. Click through to find out whether you should rent or buy a home in your state. To view the list by state, left and right arrow click on the GOBankingRate article header image, or click “view all” at the end of the article.